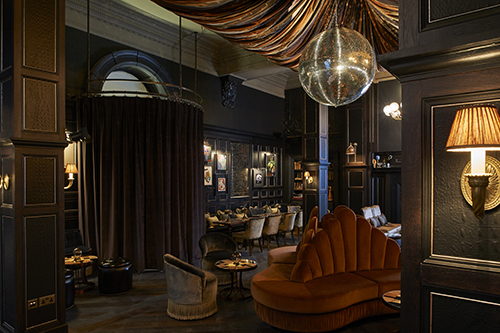 Named after Charles Fitzroy Doll, the bar at The Kimpton Fitzroy London comes into its own at night. Fitz’s has a timeless glamour and an air of illicit pleasure, whether guests are catching up on gossip, mixing with movers and shakers, or letting their hair down into the small hours. Loved the live music. I wish you would add a second night! Went for friends 40th and was great. Really well looked after and will be back! Absolutely wonderful and quintessentially London. Cocktails, service, and ambience all done exceptionally well and classy. 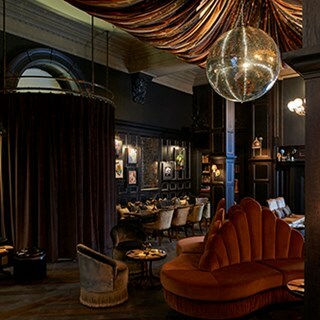 Really great interior and lovely cocktails! Service was pleasant. A great choice for a quiet, chilled out drink. Absolute 5 star experience. Beautiful atmosphere, delicious cocktails, and great service! Thanks to Kerry for taking such good care of us! Will definitely go back for a nice posh night out again. After work cocktails were a real treat, a wonderful setting - amazing service and an inventive cocktail list. The gin selection was also fantastic - would highly recommend. Fab cocktails in a really relaxed venue with a great vibe. The bar is a lovely cosy space. Really liked the selection of cocktails and the snacks. The croquettes, tuna and salmon were amazing. I did think it was really odd that the old fashioned was served in a martini glass and maybe its just me but I like a chunk of ice with my drink. However, that's a minor quibble and the staff were really nice. thank you! Great atmosphere, fantastic service and really good cocktails - had a great few hours here! Excellent staff, beautiful interior design, delicious cocktails. Paulina and the staff at Fitz's were very attentive and took care of everything. Everyone loved the canapés - the chef came up with different options for our event. Beautiful bar, incredible cocktails and attentive staff. Hugely enjoyable experience. We came for cocktails and had a great evening. All the staff were friendly and attentive and the waiters knowledgable and helpful. Cocktails were superb and we will definitely come again. Super friendly Staff, very professional and cooperative with last minute changes! Had a great time, and the whole party group was very happy with the venue. Thank you! The drinks are expensive, but the cocktails were the best I've had for ages in London and the service was excellent. It's a beautifully decorated bar with a great atmosphere. I'll definitely be back. Lovely venue, great atmosphere and staff very accommodating & knowledgeable. Great food and service. Thank you for looking after us. The staff are great and the bar is perfectly lit and furnished with a great vibe. The cocktails disappoint - we tried 6 different ones and not a single one was very well crafted. My second visit to Fitz's - just as good as the first. Excellent service and cocktail recommendations and even an acknowledgment that I was remembered from the first time.